Slot producer Microgaming created a great idea for an amazing video slot game inspired by the Old Wild West. Whether you’re a country show lover or a game lover, you will find yourself immersed in this visually exciting slot with potential for sizeable winnings. Showdown Saloon comes with some super bonuses and different features, including the attractive Free Spins feature. Microgaming released this slot in 2018. Why Showdown Saloon? The Showdown Saloon offers all of the excitement, whether it's the theme of the slot as a whole, the music or the features and bonuses. Where to play Showdown Saloon? Wild West adventures and pleasurable gaming are what the Showdown Saloon offers to its players. The slot comes with many options including the AutoPlay, changing the value of the coin as well as changing the value per spin. If you love the slot but you’re not very happy with the background music, you have an option to mute the sound too. This slot offers all of the excitement you could wish for. 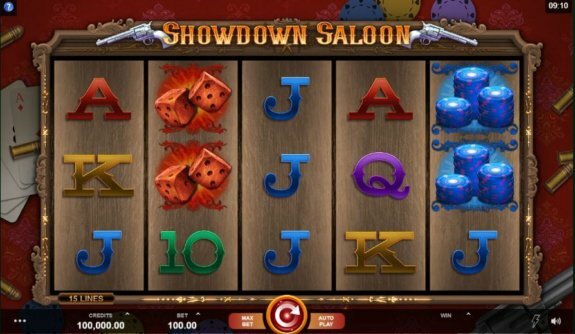 The Showdown Saloon Slot comes with five reels, three rows, and fifteen pay lines, allowing you to bet between £0.20 and £100, where the coin range starts at 0.001 and goes up to 0.50. The medium volatility could lead to some exciting winnings and provide the maximum win of more than 1500x your bet. The RTP (return to player) sits at 96% which gives you a high probability of winning back some of your spending. 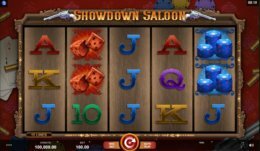 All video slot games come with a variety of symbols, features, and bonuses, the Showdown Saloon is no exception. This beautiful, cowboy-themed, formulated video slot game includes special highlights such as the Mystery Stacks feature, the Re-spin feature and the Free Spin feature. Every fan of cowboys and country-style life will find themselves enthralled with this video slot. Enjoyable, colorful and rewarding, the Showdown Saloon video slot comes with all that you would expect. 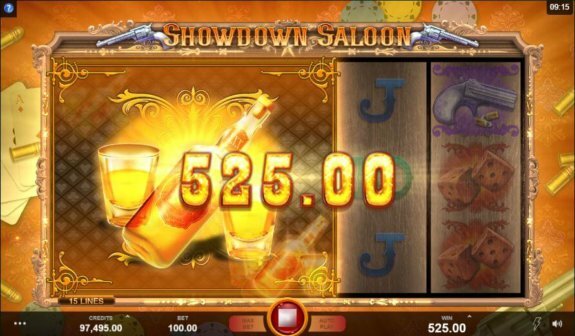 The Showdown Saloon video slot includes a range of symbols inspired by the Old Wild West, on which the slot is based. Starting with low-paying symbols, these consist of playing cards 10, J, Q, and K which reward you with between 0.2 and up to 1x your bet. Players are able to utilize the Gambling Dice symbol, which pays the maximum of 2x your bet, while the Whiskey Bottle symbol enables you to win 3x your bet. To gain 4x your bet you must secure the Poker Chip symbol. The highest multiplier is awarded with the Gun symbol, which pays out 7x your bet. The fifteen fixed pay lines read the rows from left to the right. Players have the option of changing their bet values as well as their coin values. Starting from 20 coins right up to 200 coins per spin, which means a bet of between £0.20 and £100 per spin. The maximum payout the Showdown Saloon offers to its players is 1500x the bet. 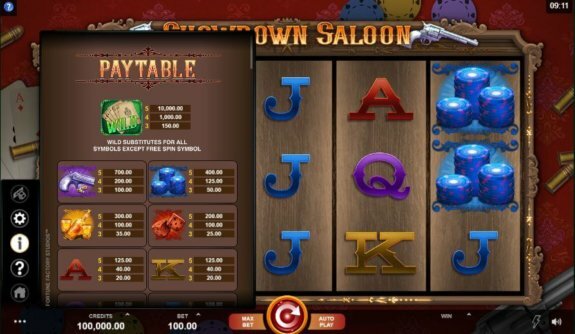 the simple rules structure of the slot enables an easy gaming experience for players; so whether you have a smartphone (Android or iOS), tablet, laptop or even a desktop computer, the Showdown Saloon can be played on any of these devices with an internet connection. Play Showdown Saloon for free! Several special features of the Showdown Saloon video slot include the Mystery Stack feature, a Re-spin feature and the Free Spins feature. All of these bonus features give you an opportunity to grab some of the great winnings to feed back into your pocket. One of the most popular of these features, the Mystery Stack, is activated randomly. One symbol will take the place of the full stack on the reel when two or more reels are coated with the Mystery Stacks. There is also a possibility to have up to three different symbols in the Mystery Stack, but only 2 reels will benefit from the same symbol. To activate the Re-spin feature, players need to get the first two reels stacked. If that happens, the stacked reels are held in their position for the re-spin. If the neighbouring reel is covered too when the re-spin is finish, then the Re-spin feature will remain. When you get three or more stacks on the reels, the Free Spins feature is activated. To gain five free spins you need a minimum of three stacks; for ten free spins – four stacks; and for fifteen free spins – five stacks. Before you play the slot game, it’s very important to consider some tips and tricks. Some of them are listed below so please read through them, but the decision is up to you. Firstly, think about playing the slot with free money, for example with the Welcome Bonus or Free Spins feature. It’s very important to get familiar with the slot before you bet with real money. Check the RTP too as the higher percentage the slot offers, the higher your chances of achieving big wins. Before you choose the game slot to play, check the reviews online, many players like to share their opinion which could be an advantage for you when selecting your game. 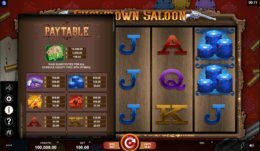 Showdown Saloon is a unique slot with a pretty good visual look and melodious music, and provides many of the key highlights that attract real players such as the special features, a lucrative RTP (96%), great winnings and many more. Initially, the slot seems to be a bit complicated but once you become acquainted with the game, it becomes an enjoyable and the relaxing experience.